S10 app icon and interface. S10 poster series for academic tasks. The “S10 Initiative” (real-world and digital elements) was developed to enhance student college experience. 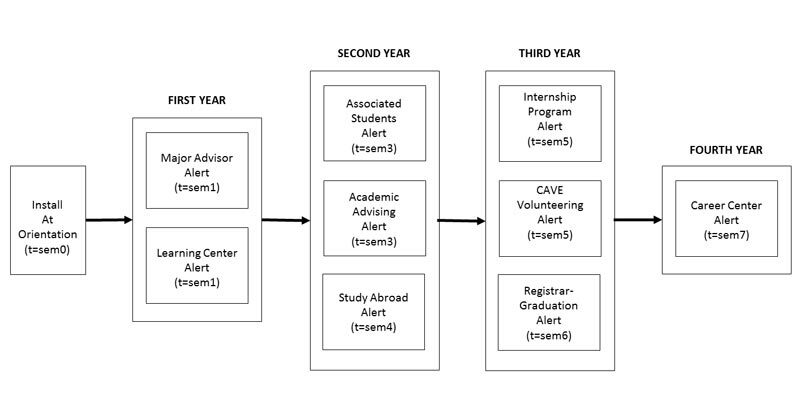 The tool was developed after a series of interviews and focus groups that examined the student experience. The digital elements include a smart phone app that displays reminders throughout the school year. The reminders direct students to campus resources that are both useful and necessary to complete requirements for graduation. Starting with attending orientation, students are directed to advisors, student government, and career resources. Real-world elements of the initiative include minimalist posters and signage developed to be displayed across campus and at each focal location. They serve as in-person reminders to stay on track. The tool attempts to address the disparity between student expectations and offered school services. Interviews revealed that many campus resources were not discovered until students were too far in their college career. The ten stops of the initiative focus on the ten most important resources every student should use in their four year career. The pitch was only given one time, so the prototype was never developed further.